Despite the old folklore that the widow year is unsuitable for getting married, bookings for wedding banquets at major hotels seem to be unaffected. People have not curtailed their wedding plans. Wedding reservations for the year 2007 are booked all the way to June. 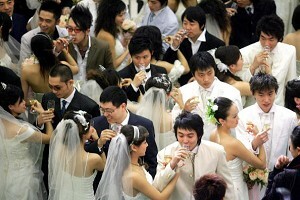 Shanghai Wen Hui News reported that according to the Shanghai Wedding Trade Association, major hotels and restaurants are heavily booked for weddings for the first half of this year. Many are booked to two-thirds of their capacity for the peak wedding month of May. Some are even completely booked on “auspicious” dates. According to the report, five-star hotels such as the Shanghai Four Seasons, Hongqiao State Guest House, and Garden Hotel have all raised the price for wedding banquets. The golden two weeks of May for getting married are entirely booked at the Hongqiao State Guest House. Reservations for weekends are also very popular. Professor Yang Lian, a long-time researcher of ancient astronomy, explained why the Year of the Pig misses the “spring beginnings.” The period from Jan. 29, 2006, to Feb. 17, 2007, is referred to as “the third and the eleventh of the twelve earthly branches year” in the lunar calendar. There are two “spring beginning” dates in this year—Feb. 4 in both 2006 and 2007.